This week, I realized how much I appreciate that the Write 31 Day-ers and Five Minute Free Writers are helping me create movement in my life. I desperately want that movement. Life should have texture, and you, fellow writers, are out there with spackle guns vigorously decorating the internet, right now. Spray on, you crazy diamonds. * Ruth, who runs The Nerd Factory, where readers think, and thinkers read. Also, she’s wicked interesting. * Jen, who is holding space and befriending dragons. * You have got to visit Actual Conversations with My Husband, because her writing keeps making me laugh at work. Sorry, cubicle neighbor. * Neta, who is enjoying The View From Here. * Wendy, who makes a darn good waffle. * Maxine, who finds happiness in the chaos. * Cheryl, over in her online corner, storying away. * Miccah, who thinks all the thoughts. * Gattina, who has a beautiful case of writer’s cramps. * Lee Ann, at the Unfocused Life. * Margaret, who has set out in quest of truth. * Diesel Noogies, who is writing about hiking in a way that will knock your wool socks right off. * Albarclay: Have I mentioned how very much I love reading hiking memoirs? Cos I do. * Julie, who is planting a garden. * Andrew, at Blessed are the Pure of Heart is frickin’ awesome, and you should go check out his blog right now. I’ll wait. * Miauw Chan, purely because I find their writing to be thought provoking. * Jenny Lawson, The Bloggess, just because I love her, and her writing makes me Feel All The Things. I’m so glad you’re all here with me. In case you need a smile, here’s something that made me smile. This blog has been taken over by the 2018 Write 31 Days challenge. 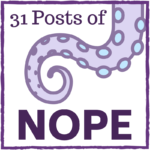 Here’s the sweet, sweet index of all my posts of nope. This entry was posted in Blogging challenge, Five Minute Friday, General, October, Post of Nope, Twitter, Weekend link love, Write 31 Days, Writing challenge. Bookmark the permalink. Yay! It’s a perfect storm of happy. Awe shucks, thank you. That’s me, the cerebral one haha! Haha! Thanks for the link back! And the Jack Sparrow meme. To find myself on the same list as The Bloggess. Whew! Thanks for including me! I love the new people I meet in this writing challenge. Write on, writers!